1 Did you always know you wanted to be a writer or did you want to be something else? The first time I can remember thinking that writing books was something I wanted to do was when I was 11 or 12. I’d gone to the library and picked up a book by Stephen King, Salem’s Lot. The librarian tried to discourage me from reading it- declaring it too scary. I remember being offended because I was a very mature kid and I understood the difference between make believe and real and I figured how scary could something I knew was fake be? Turns out- really scary! I slept with the light on for weeks. I thought it was amazing that this writer had made something up, something I knew was fiction, and yet it felt so real that I had a real emotional reaction. That’s when I knew that is what I wanted to do. However, I did feel the need to have a “real job” for a while and I worked as a counselor for people with catastrophic injuries and illness. Which, as it turns out, came in handy when writing this book. Then I start writing and it typically takes me six to nine months to actually write the book. This includes time to realize what I thought was a brilliant outline is in fact horrible and major re-writes are required. Also during this period I give my book to a couple of people to read an early draft and they offer me feedback, which then also leads to more re-writes. Once I’m done with the book it goes to my agent who might have more re-writes and then finally to my editor who has more re-writes. The moral of this story is that when you set out to write a book it helps to REALLY like the idea and characters because you’ll be spending a lot of time with them. I have no idea. I don’t’ start with a theme. Instead I start with an idea. Ideas pop into my head because of a snippet of overheard conversation, something in the news, a discussion with a friend, an old photograph- you name it- they show up and slowly begin to morph into their own thing. I believe there are millions of ideas out there all the time. The trick is to pause long enough to hear them. Then, when you do get one spend some time trying to figure out if it is a worthy idea. Is it worth months (or years) of your time, hundreds of pages, and a reader’s attention? It took me a long time to become more patient with ideas. I used to get them and then run to my computer to start writing as if I was afraid it was going to get away from me. Now I slow down, turn the idea over in my head, ask a lot of “what if” questions. What would make this situation worse? What if this character didn’t know X or Y? What if this new thing suddenly happened? If I give ideas a bit of a chance to grow they evolve into much more interesting concepts. It’s only when I have a full draft of a book that I can back up and see the themes. In the re-writes I try and make that theme more clear. What works for me is to spend time plotting and planning before starting to write. Sometimes this includes writing diary entries from different character’s point of view, making timelines, and endless lists. I usually get up early and walk the dogs or go to the gym before settling in with a cup of tea and getting to work. I’m not creative before 8am or after 10pm. I usually have three or four hours of writing/creative time before my brain gives up. I spend the rest of my day doing more business things, marketing, teaching, research etc. Also looking at random things on the Internet, yelling at my dogs to stop digging in the yard, and drinking endless cups of tea. I am a compulsive list maker. I start off each week and each day with a list of what I want to get done. On the list are not only writing goals, but also other things (including fun stuff) that I want to accomplish. When it’s close to the end of the book I tend to let things slip out of balance as I’m mentally really focused on the book, but overall I tend to do pretty well at making sure I leave a bit of time for everything. I love writing, but also all the other things in my life. I have to be really interested in the characters and what happens to them before I can write a book that is remotely interesting to anyone else. When I find a character or plot that I can’t get out of my head, that I find myself thinking about while at the gym or walking the dog. I know I have a winner. Writing is a marathon, not a sprint. Every time I start a book my feeling is: “THIS IS THE BEST BOOK EVER!” Then about ¾ of the way in I think: “THIS IS THE WORST BOOK EVER!” It’s easy to fall in love with characters and a book idea, but more difficult to stay in love over the months or years it takes to write the book- especially when things become difficult and it seems like there is no easy way to fix various plot problems. I’ve written eight YA novels, with the most recent, WITH MALICE, being number nine. I’m currently working on a new book, which will be lucky number ten. I love each of them, but the one I love the most is usually the one I’m actively writing. I think that’s because it’s still taking shape, it could be almost anything. I’m spending all my time in those character’s heads with their problems. They’re my current obsession, so they’re my favorite. This question makes me realize how parents feel when someone asks them which of their kids they like the best. In WITH MALICE the main character Jill is one of my all time favorites. I enjoyed spending all that time in her head. If I had to pick one for this book, it might be Anna, her roommate in the rehabilitation hospital. She has an inner strength that I admire and also a killer sense of humor. I find when I get stuck in a book I do better if I change up my location. I’ll take my laptop and go to the beach, a coffee shop or the library and try writing there for the day. Sometimes being in a new physical space puts my brain in a new space too. When I wrote my first book, indie publishing wasn’t really the option that it is today. I knew I wanted my books in bookstores and libraries so I targeted larger NY publishers that I thought could help me reach my dream. Writing is a solo activity and an art, but publishing is a team activity and a business. 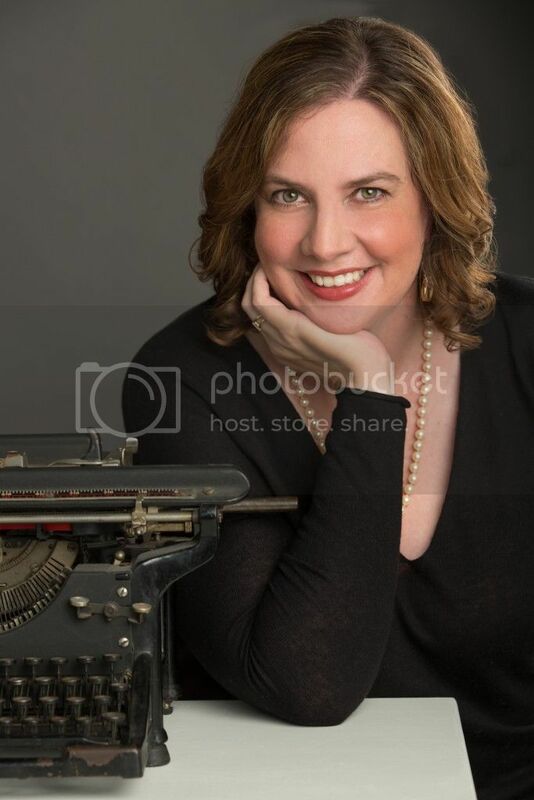 I am so grateful for the great group of people I’ve worked with at HMH from my editor Sarah to the book designer and marketing people who have all helped out. My parents are my best booksellers. When they travel on vacation they take an extra copy or two of my latest book and then end up passing it off to various people that they meet. I think they’re impressed that all those years of me making stuff up and spending all that time inside my head with imaginary friends is finally paying off. I suspect when I was growing up they wondered what the heck I would end up doing. It’s probably not too surprising that one of my favorite things to do when I’m not writing is to read. I am pretty sure someday I will be killed when one of the million stacks of books I have in the house falls over and crushes me. I’m also a big knitter, I always loved crafty things, so when I found one I could do while watching movies or listening to audio books I was hooked. If you are friends with me at some point you’ll end up with a scarf or socks. I enjoy the process of making something that I can see grow. Often with writing you can work for a long time, but not make a lot of progress. When I knit I always have something to show for it. Lastly I love spending time with friends. I enjoy throwing dinner parties and I often have huge board game nights where we play until the wee hours. Read and write a lot. Books, both those you love and even those you dislike, are great teachers. Give yourself permission to read as many as you can. Look at how the author chose to tell their story, what made you like (or dislike) a character, was there a section where you found yourself compulsively turning pages? The second half of my advice is to write a lot- writing is a craft. You get better the more you do it. It can be discouraging at first because the idea in your head is perfect and shiny and wonderful, and your first draft is not. The secret is to push through that process. This is a hard question because there are so many great books out there. As a kid I loved Ronald Dahl (Charlie and the Chocolate Factory), The Mixed Up Files of Mrs. Basil E. Frankweiler, and anything by Judy Blume. Other authors that I like include Stephen King (he still scares the pants off of me) Gillian Flynn, Kate Morton and Donna Tartt. While I don’t have one favorite book- A Prayer for Owen Meany is one I have read multiple times. And who doesn’t love Harry Potter? I don’t typically talk to anyone about my book until I have a first draft written all the way from start to finish. I find a new idea is too vulnerable to other’s opinions until I know what it is that I want to say. Once I have a draft I have a group of friends who will read early drafts and give me feedback. That’s when I want their thoughts on what works and what doesn’t- that gives me the push and direction I need to start re-writes. Yes! If I’m honest I am the happiest when I have a book project underway. During the periods when I’m not writing I feel a bit adrift and purposeless. I love the day-to-day process of trying to get an idea from my head onto the page and seeing how it evolves and changes. My current book involves a young woman who is a fake psychic. This has given me an excuse to do a whole bunch of random research including the fact that I am getting to be pretty good at reading Tarot cards. I can’t tell you too much about the book at this point, but it involves a missing girl and a bunch of lies that cause more trouble than the main character ever imagined possible. · My husband, who can make me laugh in almost any situation- that’s partly why I married him! · I cry at over the top dramatic old movies, for example Casablanca. · When I start a book and realize a few chapters in that I’ve already read it. Can I go back to Italy? I went there to research WITH MALICE and fell in love with the country. I am currently planning a trip to London and Paris as I have the very beginning of an idea that might become my next project. I’m counting on some inspiration! You can read more about Eileen, her books, and the things that strike her as funny atwww.eileencook.com. Eileen lives in Vancouver with her husband and two very naughty dogs and no longer wishes to be anyone or anywhere else. 3 winners will receive finished copies of WITH MALICE, US Only. Good to know I am not the only one who cries when reading/seeing the news. This book sounds really good. I love the cover, and always enjoy mystery/thrillers when I read them. This book sounds like an amazing read! Plus that cover is gorgeous! This has been on my wishlist since it popped up on my Amazon feed. Fingers crossed! The reader has to navigate with Jill through her memory lapses and struggles with figuring out just what happened between her and her best friend, Simone, on their once-in-a-lifetime trip to Italy. 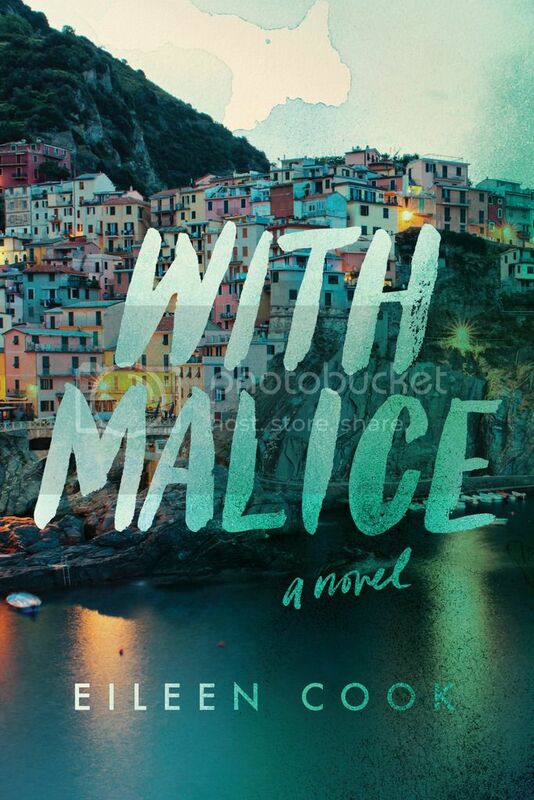 I'm not going to rehash the synopsis here or give anything away, but if you're looking for something to keep your heart pounding as you sit on the edge of your seat until the last page, WITH MALICE is the book for you.